Four exciting 2019 concerts no one will want to miss! Plus, surprise special guests at all shows. jam together all-season long at this popular concert series. In four stellar concerts featuring some of the brightest luminaries in jazz today, 2019’s Highlights In Jazz series brings together a multitude of beloved jazz musicians spanning an eclectic mix of generations and styles. You’ll hear unforgettable performances from jazz veterans including Warren Vaché, Houston Person, and Norman Simmons; up-and-comers like Veronica Swift, Christian Sands, and Peter and Will Anderson; and straight-ahead stalwarts such as Steve Turre, George Cables, Buster Williams, along with many more. These gifted players and others will pay tribute to a pantheon of jazz legends, including this year’s featured honoree, trumpeter Randy Brecker; plus, the music of Randy Weston, Erroll Garner, Sidney Bechet, Louis Armstrong will also be featured. “This year we’re saluting a living jazz great—Randy Brecker—and honoring departed geniuses,” says producer Jack Kleinsinger. With the Highlights In Jazz series nudging the half-century mark, Kleinsinger is justly proud of his ongoing legacy as a producer. “Every concert in the series has been integrated, has included a variety of younger artists and veterans, and has featured a renowned surprise guest. And every year we honor a living jazz great—let’s honor them while they can smell the roses,” he declares. 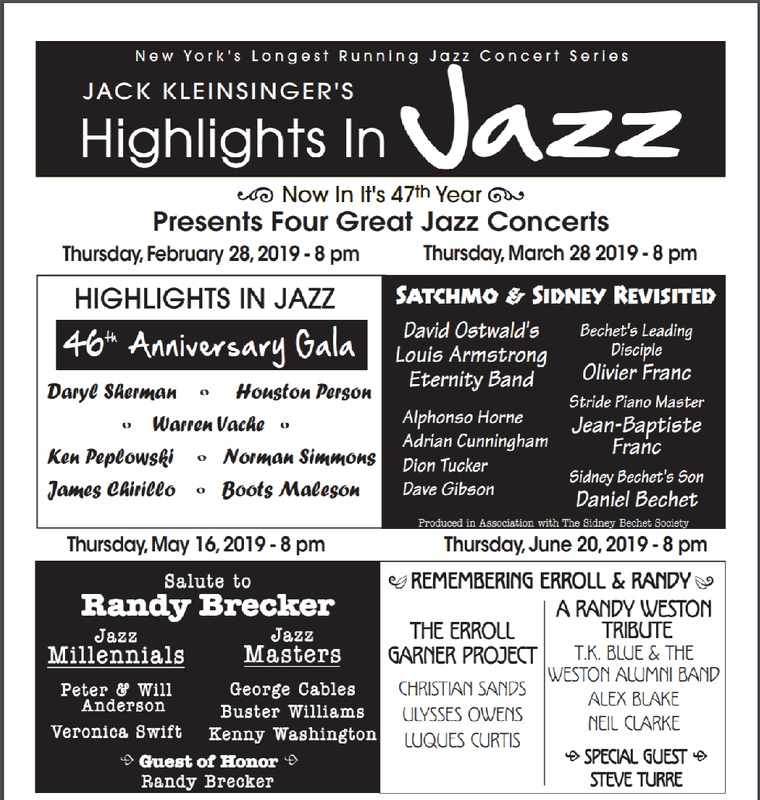 The new season kicks off with the Highlights In Jazz 46th Anniversary Gala, featuring pianist/vocalist Daryl Sherman, saxophonist Houston Person, trumpeter Warren Vaché, clarinetist/saxophonist Ken Peplowski, pianist Norman Simmons, bassist Boots Maleson, and guitarist James Chirillo. And as always at Highlights In Jazz events, a special surprise guest will be on hand. Norman Simmons wears many hats, all of them gracefully: composer, arranger, pianist, educator, and more. In his native Chicago, he led the house band at one of the most renowned clubs of the era, backing greats such as Wardell Gray, Lester Young, and Charlie Parker. Besides providing the arrangement for Ramsey Lewis’ hit “Wade in the Water,” Simmons is widely known for his work with legendary vocalists including Carmen McRae, Anita O’Day, Betty Carter, and Joe Williams, and for his special feel for the compositions of the great Duke Ellington.